Badges and how to create them. There are two methods to give badges to your friends. c. Type in avatar name that you and hit the "Grant Button"
Automatically give badges to profile page visitors who requests them. b. Click on the "Edit Settings"
If you see a badge you like, the best way to get one for yourself is to ask the person who created it. Here is where it gets interesting. You can't automatically know the creator of every badge. However, many badge creators will put details in the badge description itself. See a badge you like? Click on it to see if there are instructions in its description on how to get it. 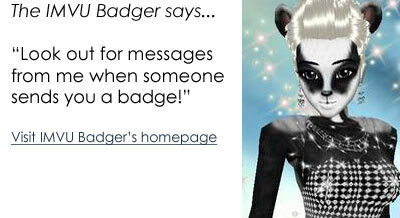 Each time you get a badge you will receive a homepage message from "IMVU badger" to let you know. 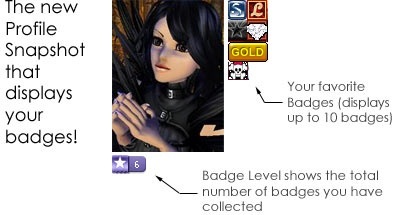 Here are some helpful collection tips from PurpleHaze, a prominent IMVU Badge collector. A little genuine friendly courtesy and respect goes a long way. Use please and a return thank you frequently. If someone makes a mystery badge and you discover who the owner is, do not expose the owner publicly. When applying your own code of ethics, never forget badge owners have every right to revoke a granted bling. Remember that while hunting badges you may just earn something more precious than the badge, FRIENDSHIP. To show or hide the badges in your collection, go to your Avatar Card under Account Settings and drag and drop badges into your badges grid. only the badges you have arranged on your grid will show up on your avatar card for others to view. (Clicking on any avatar profile pic or avatar name brings up the avatar card for that person. The two left 2 columns of the grid are white. Save these spaces for your most cherished badges - they will display to the right of your profile picture in most locations: on your Avatar Homepage, on the Messages you send, etc.